HALLOWEEN PARTY MANHATTAN – TIMES SQUARE HOTTEST HALLOWEEN PARTY! HALLOWEEN OF TERROR! HALLOWEEN NIGHT TIMES SQUARE PARTY! 1 DAY - 1 EXCLUSIVE EVENT! MUSIC BY NYC HOTTEST DJS AT MIDTOWN NYC HALLOWEEN TIMES SQUARE PARTY! TICKET EVENT 21 & OVER ! HALLOWEEN NIGHT PARTY @COPA CABANA TIMES SQUARE MANHATTAN, NY! CAPACITY EXPECTED! BUY YOUR TICKETS NOW FOR JUST 10$! 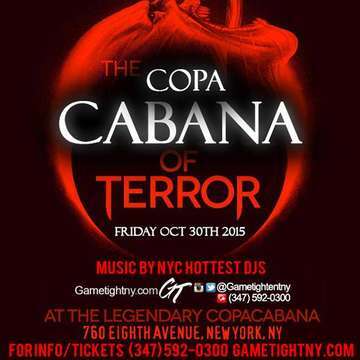 Copa Cabana NYC Halloween Dress Code: Its Halloween – be creative! Costume is HIGHLY SUGGESTED! Copacabana NYC Halloween Bottle Packages: Bottle Prices available by request.